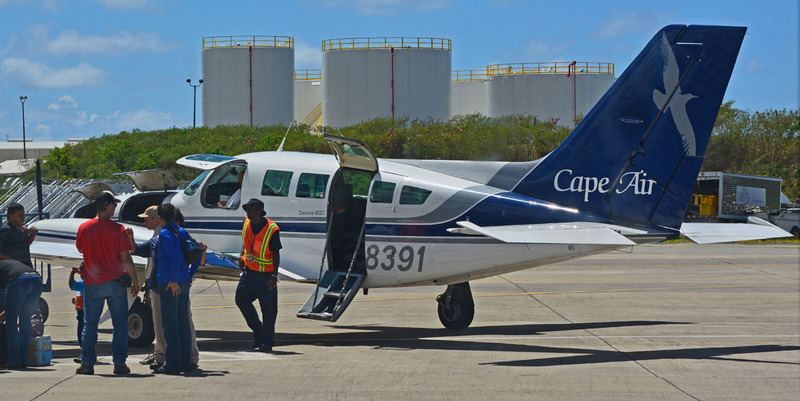 This little Cessna airplane with a passenger capacity of eight took us from the Virgin Islands to Puerto Rico. 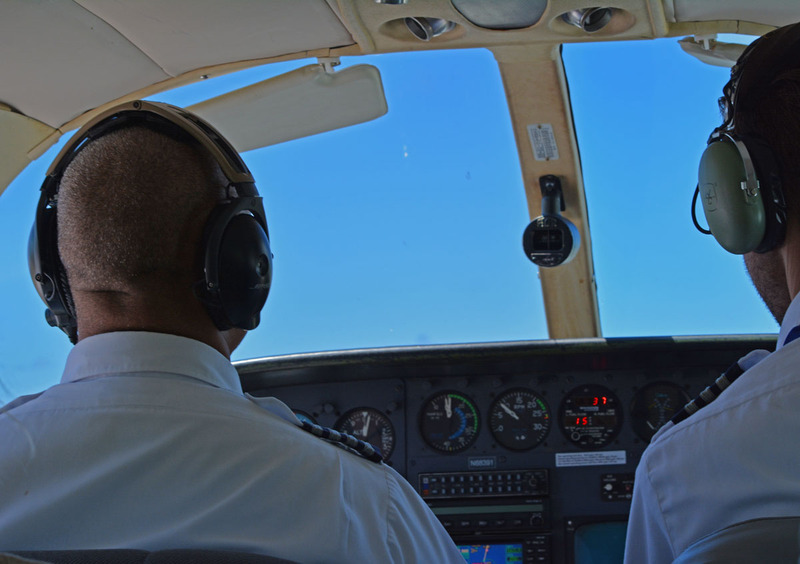 Being seated right behind the pilot and co-pilot was a very different experience from the strict separation of cockpit and passenger cabin in larger airplanes. There was no stewardess offering a glass of water and package of pretzels, either. As a matter of fact, I don’t think there was even a toilet. But what the plane lacked in service, it made up in viewshed. One of the other passengers asked what it was and the co-pilot responded that it was sand from the Sahara desert that was carried across the ocean by windstorms. Boy, was he wrong! We had just come from a resort that had to remove truckloads of this stuff from their precious beach area every single day. Does this look like desert sand to you? Of course not – it is seaweed! Sargassum seaweed to be exact. And it originated in the Sargasso Sea. 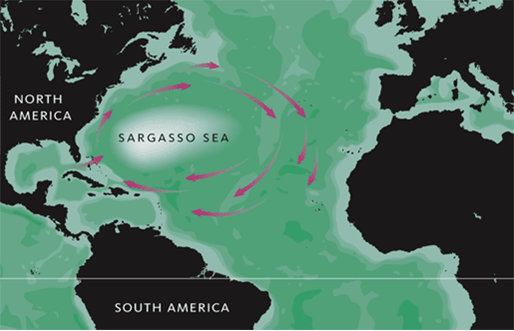 The Sargasso Sea, located in the North Atlantic Ocean, is the only sea that has no land boundaries around it; instead, it is defined by ocean currents. Its Western boundary is defined by the Gulf Stream; in the North, it is bounded by the North Atlantic Current; in the East, the Canary Current, and in the South, the North Atlantic Equatorial Current. This whole area is about 1,100 km (700 miles) wide and 3,200 km (2,000 miles) long. Bermuda lies near the Western edge of the sea. The Sargasso Sea is known for its dark blue waters and great underwater visibility as well as massive amounts of seaweed. 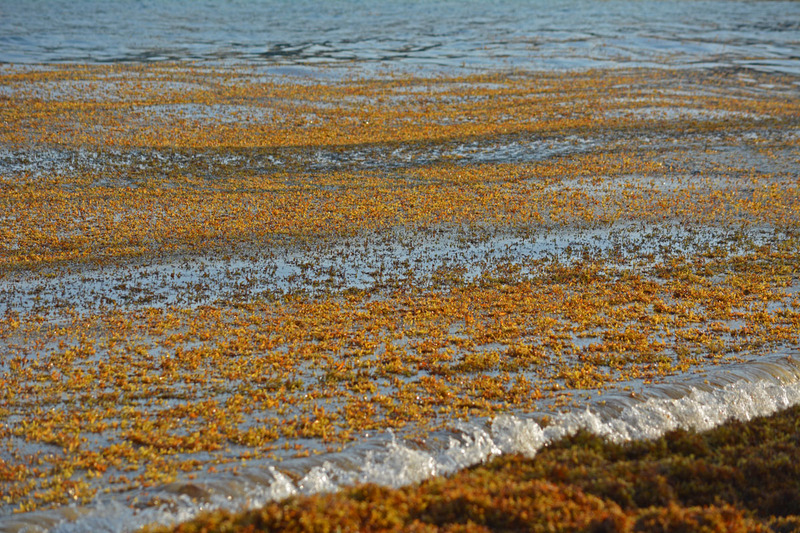 In fact, the area was named after a type of free-floating seaweed called Sargassum. There is so much of it in the Sargasso Sea, that legends arose of ships being trapped in the seaweed and becoming ghost ships after the crew died. These huge patches of seaweed were mentioned by early ocean explorers, centuries before Columbus. 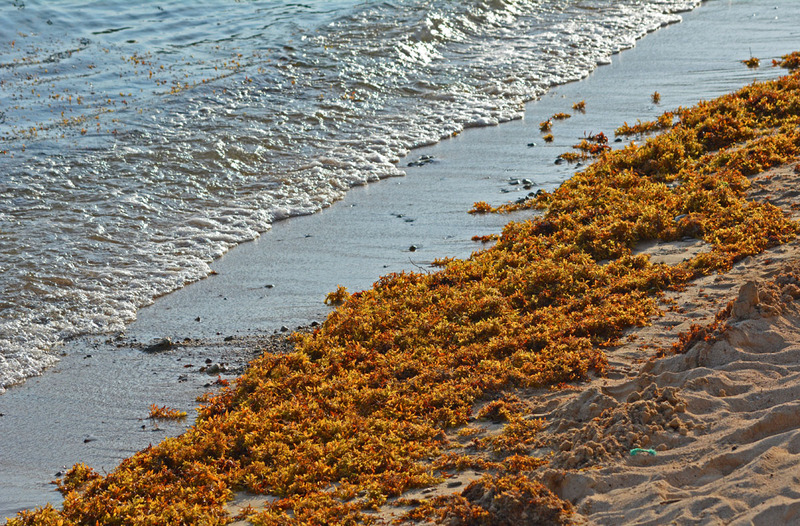 The Sargassum seaweed provides shelter and nourishment to an amazing variety of marine species: turtles, shrimp, crab, and fish. It is a spawning site for endangered eels. Humpback whales and birds migrate through the Sargasso Sea and depend on it for food. Unfortunately, the Sargasso Sea has also become a huge accumulator of plastic waste known as the North Atlantic Garbage Patch, similar to the Great Pacific Garbage Patch. 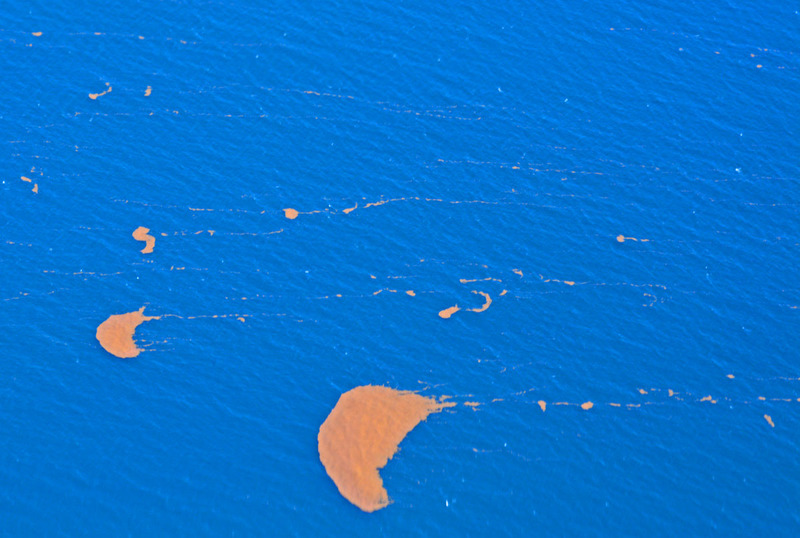 The Sargasso Sea Commission was established in March 2014 by the governments of the Azores, Bermuda, Monaco, the UK and the US to protect this unique marine environment. For more interpretations of “Above”, check out Ailsa’s Travel Theme. 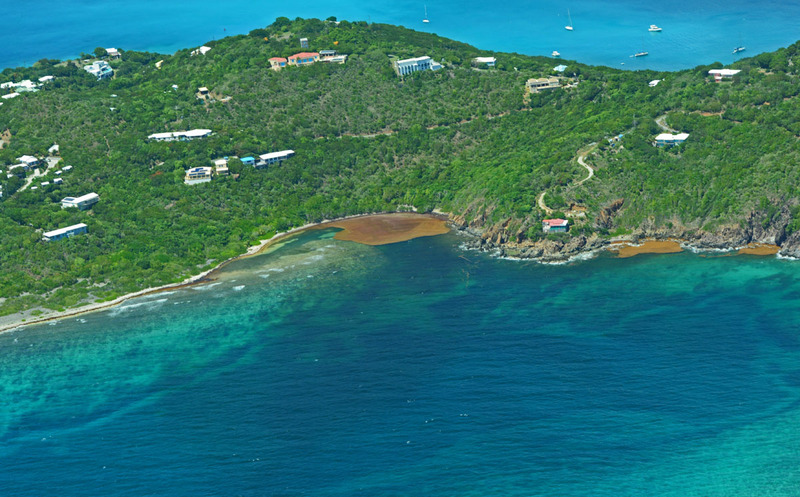 This entry was posted in Travel Theme Challenge, Travel Virgin Islands and tagged Atlantic Ocean, Cessna, commuter plane, North Atlantic Garbage Patch, pilot, Sargasso Sea, Sargassum, seaweed, St. Thomas, Travel Theme: Above, Virgin Islands. Bookmark the permalink. What a beautiful place to go. thank you, Glenda, so glad you enjoyed this post that you decided to re-post. Yes, the Sargasso Sea has all kinds of mystical connotations and it was referred to as early as 4th and 5th century BC in Europe! Now that really piqued my interest. Will go do a little research… thank you. That is absolutely fascinating about the “Wide” Sargasso Sea. I had no idea that it had no land borders, how interesting. Barbara – I was a bit squeezy at first when I saw this tiny plane, wondering whether it would be a bumpy ride. But it was smooth as silk and I loved flying lower so I could actually take some decent photos. 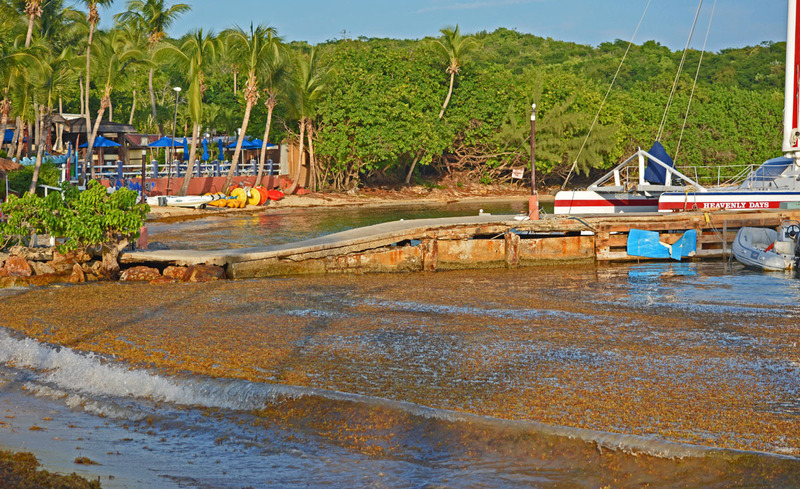 The seaweed islands are fascinating – like blown commas. Makes me think of Matisse. Yes, there were all kinds of patterns – sometimes long lines, sometimes these paisley or comma patterns. The views from the plane are striking, especially the woods. There is something that I just love about woods. 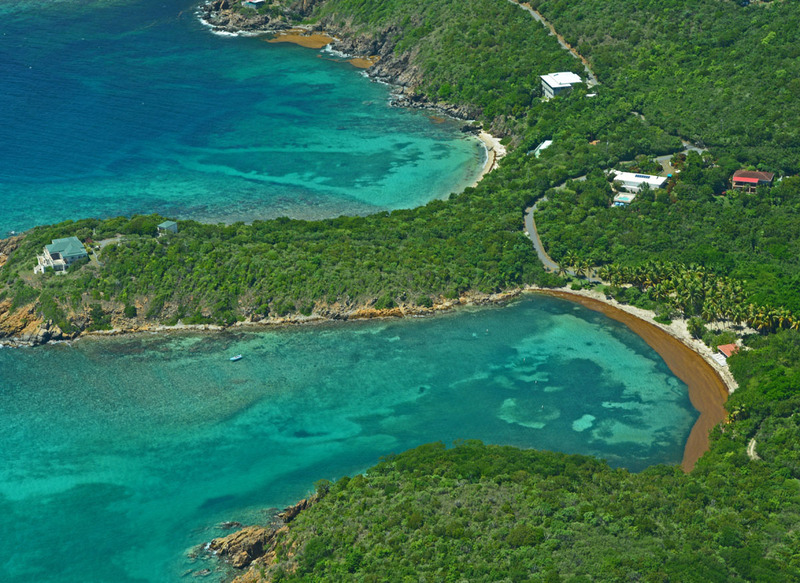 The color of the water is something else – just beautiful. I flew on an eight sitter from Zanzibar to Dar-es-Salaam and it is the best view I have ever seen from above. The coral reef color was spectacular, for lack of a better word.